Aquarius Soft PC Currency Calculator offers the convenience to perform money convertion / exchange rate on your desktop, saving you the hassle of connecting to the Internet! 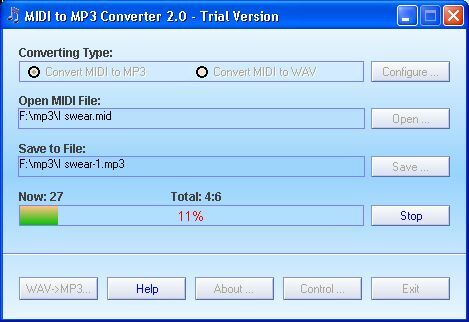 MIDI to MP3 Converter is designed to convert MIDI to MP3, convert MIDI to WAV. A built-in WAV to MP3 Converter included, so it can also convert WAV to MP3. ImTOO Ripper Pack Platinum consists of 5 super rippers and converters: ImTOO DVD Ripper Platinum, ImTOO DVD Creator, ImTOO MPEG Encoder, ImTOO Audio Encoder and ImTOO CD Ripper. It can convert video DVD to MP4 Video files suitable for Zune, iPod or PSP devices! This software is the best for converting DVD to MP4 files in speed and compatibility. DVDs can't be converted by other converters may be supported by this software. It can convert video DVD to MP4 Video files suitable for iPod or PSP devices! This software is the best for converting DVD to MP4 files in speed and compatibility. DVDs can't be converted by other converters may be supported by this software. Wondershare DVD to MP4 Converter for MAC is one of the first DVD to MP4 converters for Mac OS users to rip DVD to MP4 files for playback on iPod, PSP, Apple TV, iPhone and other popular MP4 players on Mac OS. A simple currency calculator which can convert about 200 world currencies including USD, EUR, CAD, AUD, CHF, JPY, etc. Live exchange rates. Use CurrencyManage Paper Money Collecting Software to inventory and value your currency collection. It Ships with a comprehensive database of all US Bank Note varieties as well as an additional database of all 14,000+ National Banknotes. 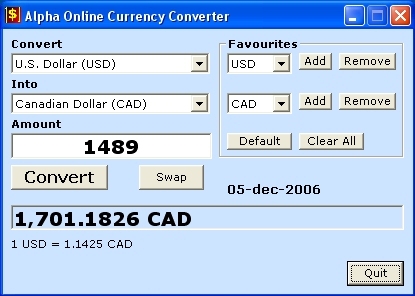 Currency Converter FX is an easy to use financial utility that allows you to get latest currency exchange rates for more than 150 currencies. All rates are collected live from the internet so they are always current.